To dig or not to dig? That IS the question. 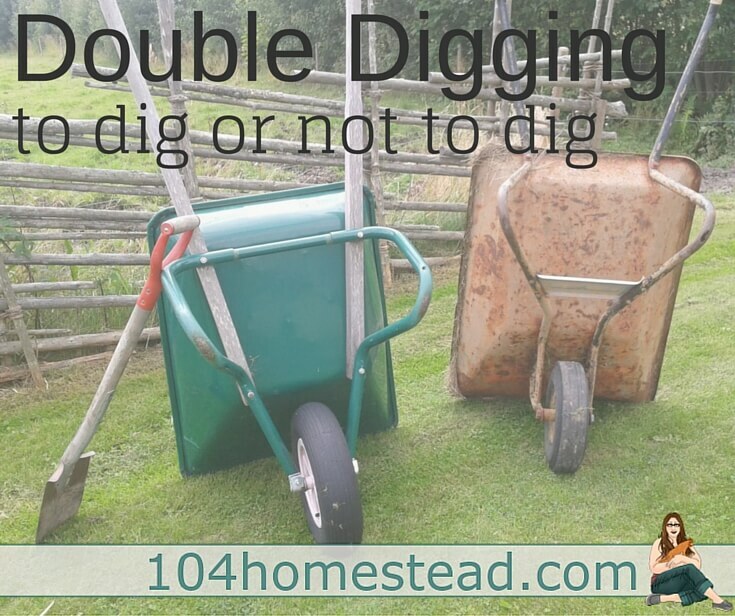 Double digging is purported as being one of a gardening’s time-honored traditions and is mentioned in some of the greatest gardening guides around. Even in a few of my favorites. Dig a trench in area 1 that is 12-18″ wide and about the depth of your spade. Put the soil you dig up into a lawn cart. Move to area 2 and repeat the process, only this time instead of putting the soil you remove into the cart, you put in into the trench you dug in area 1. Continue this pattern until you reach the end (in our fabulous diagram, it’s area 5). This time when you have finished loosening the soil and adding amendments you put the soil from the lawn cart on top. Why Double Dig Your Garden? It allows for easier root penetration at greater depths, which is great for root crops (see below). It improves soil drainage by breaking up areas that are compacted. Adding amendments to the top soil makes it easier for earthworms and rainwater to incorporate the amendments into the soil at root level. When carrots and other root vegetables meet hard and compacted soil they will stop growing down and instead get wider. If you have double-dug your soil, your carrots and other root vegetables can grow down further and reach its maturity potential. I’m not sure about the state of your carrots, but mine tend to be short little stubby things and never worth the effort of canning. See: Carrot Woes for tips for getting carrots to germinate. 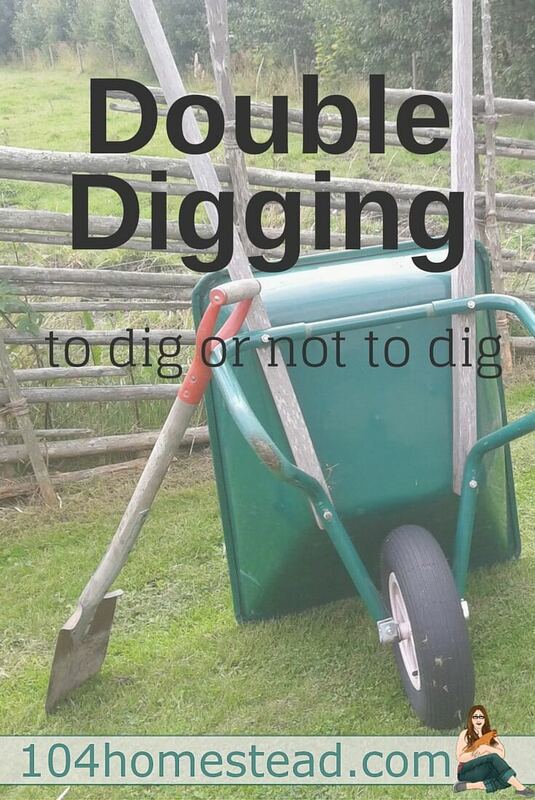 Why NOT to Double Dig? There is some research however that says not to double dig. There is an entire ecosystem under that topsoil that can easily be destroyed when disrupted. There have been side-by-side tests of gardens that have been double-dug versus those that haven’t and often times the more compact soil performs better. So that brings us back to the age-old question. To dig or not to dig? I’m not going to tell you the answer. I don’t even know the answer. What I do know is what has worked for me. I save myself a lot of back-breaking work by not double-digging except when I am adding a new garden space or when I am planting root crops. Carrots are not too picky when it comes to nutrients, but they are very picky about dense soil and obstructions like rocks. Do you double dig your gardens? What have your results been like? You forgot to mention a couple things… pull all the weeds out first (get the roots), and when you put the sod from section 2 onto section 1, put it upside down, to kill the grass and any weed seeds left. Use a wide shovel, and only go 3 shovel widths per section (rather than 5 like the drawing), then leave a walk-thru area (that you can double dig NEXT year (instead of trying to do it all at one time). Also, don’t expect a decent crop the first year. Your amendments (blood & bone meal, manure, perlite, compost, Epson salt, etc) need time to break down enough to be usable to the crops you sow. Oh you can plant your seeds, they just won’t be as great as next year, because all that stuff is heating up and percolating under there. In fact, I’ll bet those guys doing the test didn’t wait a year! I am like you. I double dig to start a garden bed. I do not have the time to double dig all my beds every year anyways. After the first time I just keep adding compost and ashes and quickly rake in. I sheet compost in the winter and add animal bedding and manure on top of beds I am not using. My soil beds are not step on or compacted, if possible. Nature does it double digging with moles and other critters so I do not believe it is bad. We are dealing with a totally new type of soil on our Mississippi homestead. In Louisiana, our soil is often described as coffee grinds. It’s dark, loose, and fertile. Our land in Mississippi is a layer of topsoil over a base of red clay. Double digging there would be a huge mistake. So we just tilled in the green cover crop and now we’re adding peat and compost. Hopefully, this will work best. This was a great article and I’m glad you brought up all those points, both pro and con. I’m just lazy and would rather throw layers down onto the soil instead of having to dig. After 25 years of active gardening, I’m kinda over digging – ya know? 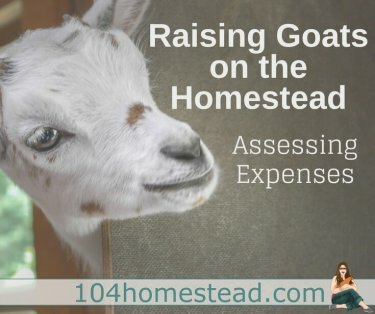 Thank for sharing at Green Thumb Thursday and congratulations because this article was chosen as a featured one – feel free to grab the featured button when you link up this week! Thank you so much for choosing to feature me Tessa! I do both and I don’t think there is an absolutely correct answer to which is better. It depends. The John Jeavons “Grow Biointensive” gardening method involves double-dug beds, feeding the soil with compost, and planting closely to conserve spacing and create a microclimate. I use this method with my potato bed each year. Of course I rotate my planting beds, so eventually all the in-ground beds are double dug. I also have raised beds that I don’t double dig but do mulch heavily. I’ve done both and feel the back work involved in all that digging is not worth the effort. I’ve long been a fan of Ruth Stout’s deep mulch method. I am all against the digging methods, double or once! It might give good results in short term but over the long term it robs your soil of good nutrients and fertility which translates as more work every year then on. As for the carrots, you can always have raised beds for them or big flower pots, that way you can control their soil without disturbing much larger environment. Put me down as a militant non-digger. 🙂 As a Permaculturist, I’ve realized nature has spent a lot of time and effort getting the soil how its supposed to be. I don’t want to disturb the earthworms, fungi networks, and millions of other tiny niches down there. In very drastic times when I know soil has been compacted for a long time (like a hardscape path or structure was there) and I want to build a bed, I’ll insert a pitchfork or similar tool and gently lift the top layer of soil a little without taking any soil of anything out of the ground. That gives it a little bit of leg up and improves hydration and such before I sheet mulch or whatever I’m going to do to build the bed. We double-dug our garden many, many years ago. We are no-dig gardeners now (sheet composting). Not only is gardening much easier now, but our results are much superior. that’s why my carrots are always so stubby! thanks for some “dummy know how” that will help me this year!